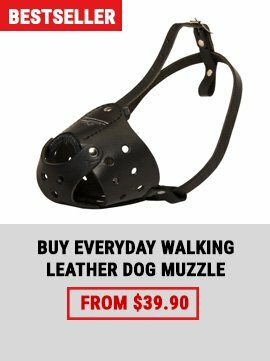 It’s known that all leather things need a special treatment and a muzzle bought for your dog is not exception. Dog experts recommend to clean regularly a leather muzzle from dust, mud, saliva, grass, seeds, sand etc. Better if you take a habit to do it after every walking or training. Remember! A dirty muzzle can cause an infection disease or skin irritation! After you have made a mechanical cleaning of a muzzle with a brush or in warm running water, you have to dry it with a soft rag. Please, don’t dry a muzzle with any heating devices, on radiators, nor by an open fire. An intensive impact of heat can make damage to the leather the muzzle is made of. For the best storing keep your dog’s muzzle in a special bag sewn of some natural cloth (flax or cotton). It’s also recommended to put a leather muzzle in a dry, rather warm place. You can also use special leather conditioner and water repellent for your dog’s muzzle treatment. Once a month is enough. Be advised! To avoid allergy and skin irritation of your pet, make sure that special agents you are going to use don’t contain any toxic substances! 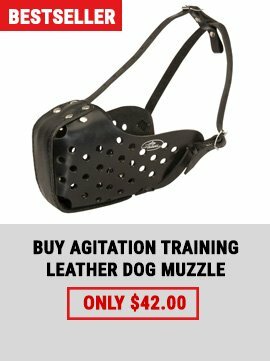 We hope, following these recommendations will help you to prolongate the use of the muzzle you have chosen for your pet!